Easy Chocolate Cake with Sour Cream Chocolate Frosting is the perfect dessert for any occasion. This rich and moist chocolate cake is made in a 9×13-inch pan and finished with smooth and creamy chocolate sour cream frosting. This is everyone’s favorite chocolate cake recipe! This post is sponsored by Tillamook and Kroger. Is there anything better than a rich, moist chocolate cake with smooth chocolate frosting? YES! An EASY chocolate cake that is still rich, moist, and finished with the most amazing chocolate frosting. I LOVE a good chocolate cake, but not if it takes me hours and hours to make, bake, and decorate. I am all about easy when it comes to cakes, as long as the end results are amazing. And let me tell you, this Easy Chocolate Cake is the BEST chocolate cake because it is SO easy and SO SO SO delicious! I guarantee this will be your go to chocolate cake from now on. 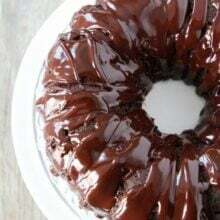 I love this chocolate cake recipe because it is made in a basic 9×13-inch pan and that means no chilling cake layers or decorating cake layers. 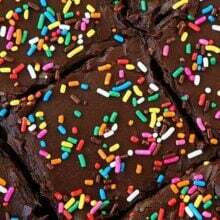 You don’t need to do a crumb coat of frosting, you pour the cake batter in the sheet pan, bake, and top with chocolate frosting. It is SO simple! I also love that it is made in a simple 9×13 pan because it is easy to take to parties, picnics, and potlucks. The cake is easy to cut into squares and serve, and it feeds a crowd! 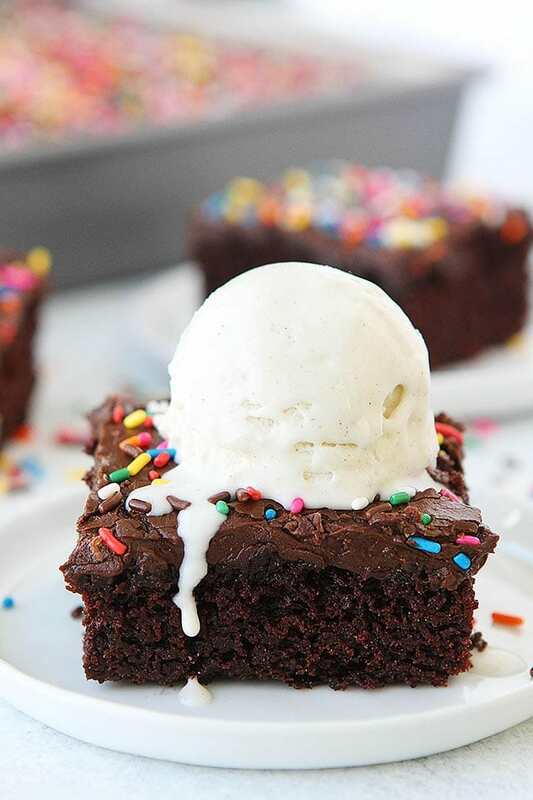 Because this chocolate cake recipe is so easy you might second guess how good it is…until you have one bite, then you will be sold for life. 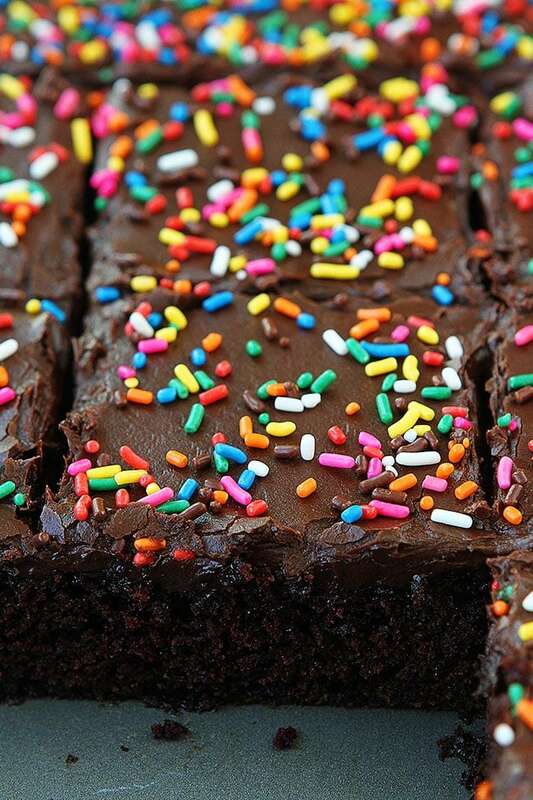 This is the best chocolate cake! 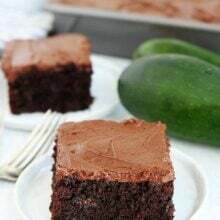 The cake is rich, moist, has the perfect tender crumb, and is finished with the most amazing chocolate sour cream frosting. The secret ingredient for this cake is Tillamook Sour Cream. The cake has sour cream in the cake and in the frosting. The sour cream keeps the cake super moist. If you have made my chocolate sour cream bundt cake, you will for sure love this cake! The chocolate sour cream frosting makes it even more decadent and divine! 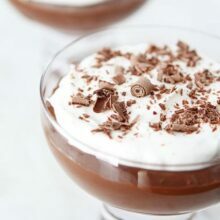 The addition of sour cream to chocolate frosting makes the frosting super silky and smooth and it’s not overly sweet, making it the perfect frosting for the chocolate cake. It’s perfection! All of the ingredients are simple and can be found at any Kroger store, even Tillamook products! Did you know Tillamook is expanding and you can now find Tillamook products in select Kroger stores nationwide? Yay! The cake only takes 25-30 minutes to bake, depending on your oven and the chocolate sour cream frosting is easy to whip up! We like to decorate the cake with Kroger’s rainbow sprinkles just for FUN! 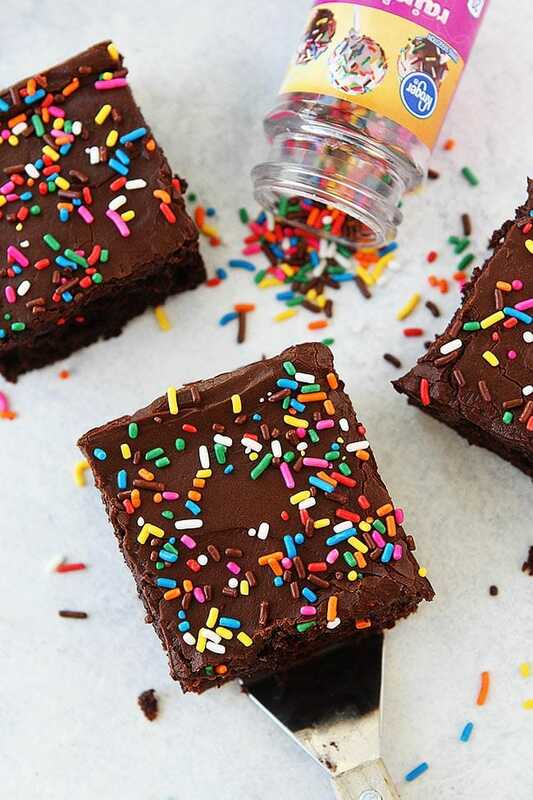 Sprinkles are always a good idea! 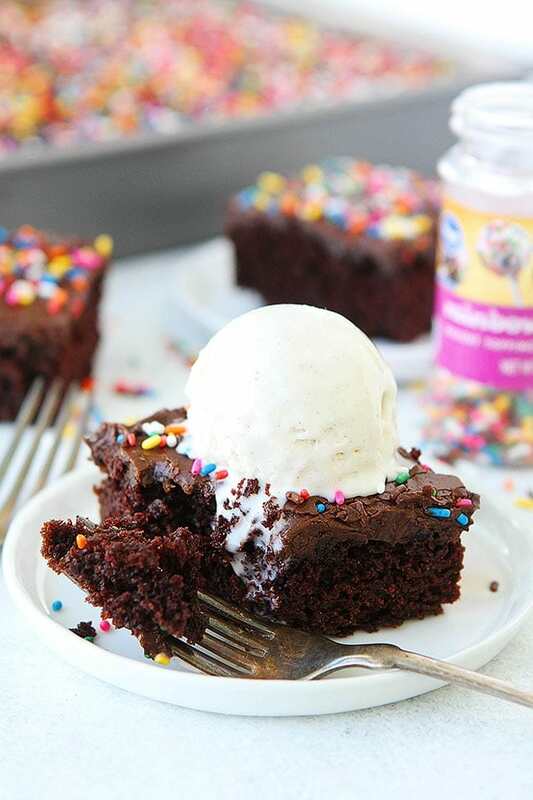 And if you want to go all out, serve a piece of chocolate cake with a big scoop of Tillamook Ice Cream! That is how I like to eat my cake! Ok, now I wanted to share a little recap of my trip to Detroit to celebrate the expansion Tillamook products in Kroger stores nationwide. It was a #LegenDairyWeekend, hosted by my friend Sarah. I hope you followed along on Instagram because it was a ton of fun. I always love getting together with other bloggers, especially when good food is involved and we were spoiled with good food from Tillamook and Kroger all weekend long! 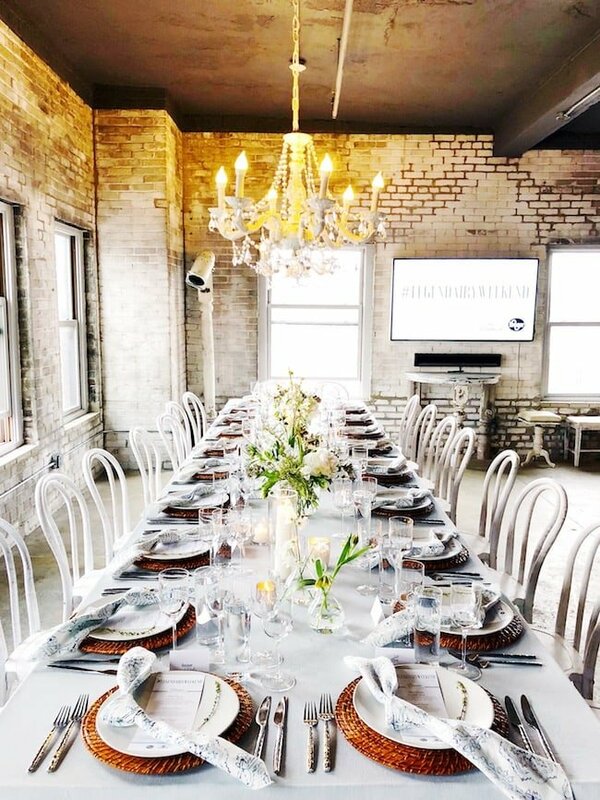 We kicked off the weekend with the most beautiful dinner. The entire meal featured Tillamook and Kroger products and all of the courses were delicious. I am still dreaming about that meal! I think it was fancier than my wedding..ha! 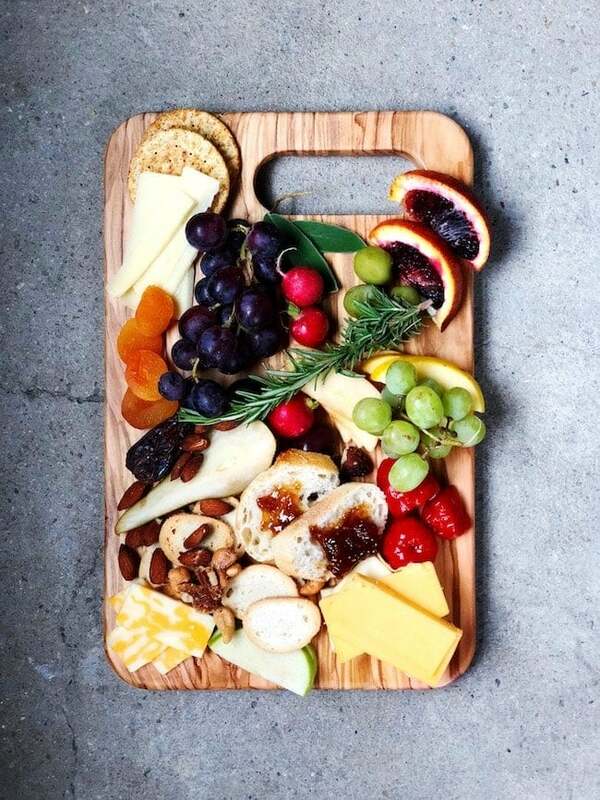 During the weekend, we also had a smoothie bowl bar, an amazing brunch, made candles, and learned how to assemble and style cheese boards…and I ate more than my fair share of Tillamook cheese, it’s too good:) It was such a fun trip! Side note-if you go to Detroit, stay at the Foundation Hotel. It’s a super cool hotel. For the cake: Preheat oven to 350 degrees F. Spray a 9x13-inch pan with nonstick cooking spray and set aside. In a small saucepan, combine the butter, water, cocoa powder, and salt and place over medium heat. Cook, stirring with a spatula, just until melted and combined. Remove from the heat and set aside. In a large bowl, whisk together the flour, sugar, and baking soda. Add half of the melted butter cocoa mixture and whisk until completely blended. The mixture will be thick. Add the remaining butter mixture and stir until combined. Add the eggs, one at a time, whisking until completely blended. Add the sour cream and vanilla extract and whisk until smooth. Pour the cake batter into the prepared pan and bake until a toothpick inserted into the center of the cake comes out clean, 25-30 minutes. Let the cake cool completely before frosting. For the frosting: In a large bowl, sift together the powdered sugar and cocoa powder. In the bowl of a stand mixer, beat the butter until smooth, about 1 minute. Scrape down the sides of the bowl and add the sifted powdered sugar and cocoa, sour cream, vanilla, and salt. Beat until frosting is smooth, about 3 minutes. If you need to scrape down the sides, do so, and mix again. Frost the cooled chocolate cake with the chocolate sour cream frosting. Decorate with sprinkles, if desired. Cut cake into squares and serve. This cake literally looks like it’s a party in your mouth! Can I use GF flour? I haven’t tried it. If you do an all purpose gf flour it should be fine though! Looks amazing! For the cake, is it OK to use Dutch process cocoa? Hi. My daughter and I made this cake this weekend and we put it in a 9×13 like the recipe said but it was much higher than yours. At the risk of sounding like I haven’t a clue (which maybe I don’t! ), was this supposed to go in a bigger sheet pan? 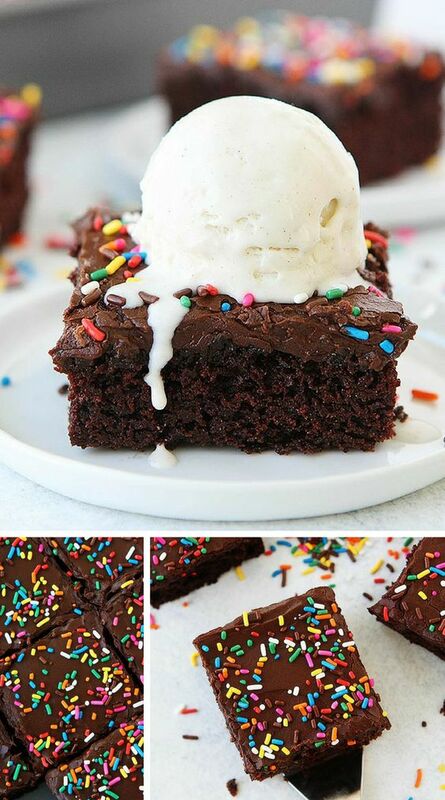 In the pictures yours look more like cake type brownies for a height and mine went almost up to the top of a 9×13 pan. Just thought I would check. The house smells AMAZING! Thanks for all your great recipes!!! Hi Laurie-I make this cake in a normal 9×13 pan. If you want a think cake, you could probably do it in a jelly roll pan, but it will be a lot thinner. How do you store this cake? Refrigerator or counter? Thanks!! I just made it and it’s so yummy!! I store it on the counter, covered. I am so glad you like it! Yummy cake with beautiful toppings, it looks so divine. Can you make these as cupcakes? Yes! Just reduce the baking time. In your recipe directions you suggest using a whisk to combine the ingredients. Why not use a hand mixer? This is a really very easy recipe and I am going to make it today. I love such moist cake and will update you after I bake it. I’m all over a simple chocolate cake for picnics and weekend snacking in the summer. 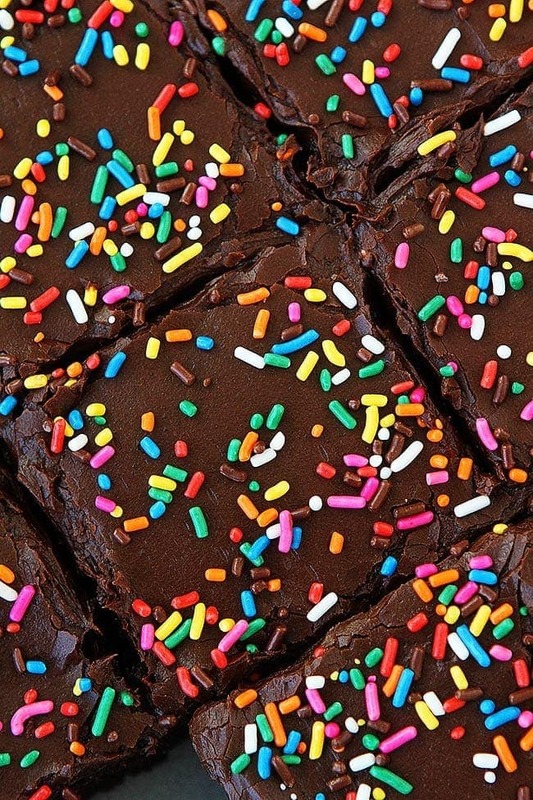 Your chocolate cake with rainbow sprinkles needs clarification. The recipe says to pour into a prepared 9×13 pan, but you say above that that it’s great because it’s a sheet cake. Which is is? I made it and did the 9×13, but the cook time was off and it didn’t look like yours…..bummer to spend the time and ingredients when the recipe is confusing. The recipe is written for 9×13 pan. This is the second time im baking this cake ! It’s absoluty delicious!! I will only make this chocolate cake from this Day forth ! Wonderful cake !! I have made this recipe at least TEN times since seeing it on your website! My husband is obsessed and my grandchildren love it, too. You can’t go wrong if you add 1 cup of mini chocolate chips and bake for about 5 minutes more. YUM! So happy you like the cake! Love the chocolate chip addition! Easy, beautiful cake. I did not have cocoa, so I doubled the vanilla and added 1 T orange liquer. Of course, I concocted an orange glaze to top it off. What flour can I use instead of all-purpose flour? My cake was quite a bit paler than the one in this pics. I’m wondering whether 1/3 c cocoa was correct. Should it be 1 1/3? 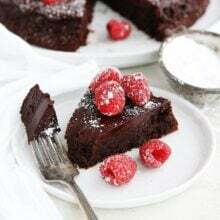 The texture was nice, but aside from lacking much chocolate flavor, it was too sweet, even after cutting back the sugar to 1 1/2 c.
This is my go to chocolate cake as it is so simple to make and perfect for any occasion. I live in Spain where sour cream does not exist, so I substitute yogurt and have not had any issues- cake and frosting are perfect. I’ve used the recipe to make cupcakes, 9×19, 9×9, etc. It is so versatile!